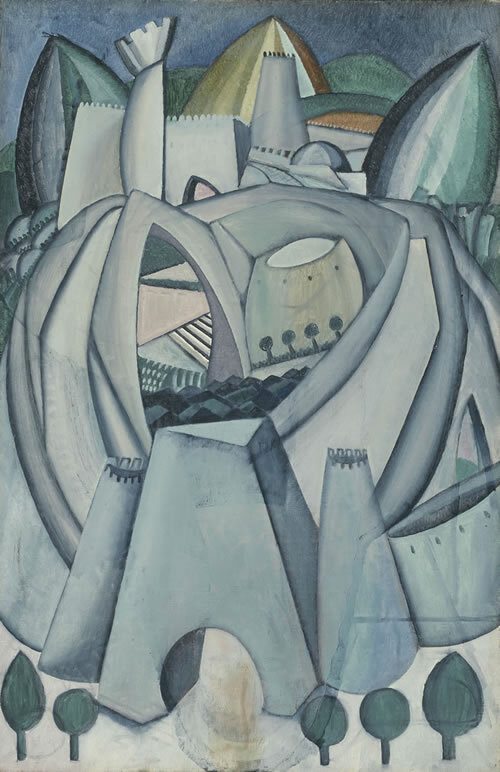 Portugese-born painter Amadeo de Souza-Cardoso (1887-1918) was one of the most commercially successful artists at the Armory Show, selling seven of the eight works he lent to the exhibition. Although he had participated in avant-garde exhibits abroad, the Armory Show marked his American debut – a major milestone in his tragically short career. Souza-Cardoso’s unique and personal style was unexpectedly popular with American collectors: despite knowing very little about the artist, they were eager to acquire examples of his work. He sold three paintings to collector Arthur Jerome Eddy; two to fellow Armory Show exhibitor Robert Chanler; one to artist Manierre Dawson; and one to collector Elizabeth S. Cheever. Encouraged by this success, Pach attempted to organize additional exhibitions of the artist’s work in New York. But with the outbreak of World War I, Souza-Cardoso was forced to stay in Portugal and his isolation thwarted Pach’s efforts.